Each school year, many different events and fundraisers take place. These are organized to help our local school get things they may need for the best learning environment for our kids. One of these events that takes place is Box Tops for Education. If you have school aged kids, then I think you may have heard of Box Tops for Education. But if you haven’t and would like to learn more, then read on. Box Tops for Education offers a Clip program that allows you to earn cash for your school by clipping the Official Box Tops for Education “Box Tops” from the packages of hundreds of purchased participating products. Our school actually does this earlier in the school year. We cut these labels off General Mills products all the time. They can be collected all year long to send in during this time. I spoke a bit about Box Tops in the past here. But recently, I purchased a few more General Mills products at Walmart to add to my Box Top Clip collection. What did I get? I bought Honey Nut Cheerios™ – Family Size, Yoplait® Original Fridge Pack – 4 Strawberry / 4 Harvest Peach, Mott’s Medleys® Fruit Snacks – Family Size 40 ct.,Old El Paso™ Taco Dinner Kit and Nature Valley™ Crunchy Oats ‘n Honey Granola Bars – Value Pack 24 ct. All General Mills products our family enjoys here often. So, of course, I added to our Box Top Clips just from these 4 products. But now, you can also earn even more cash to help your school get what it needs through the Box Tops for Education® Bonus App. Yes, there is an app now for just this purpose. This app is available on both iTunes and Google Play. Yes, there is even an App now for this! With this app, you can most definitely easily earn more for you school. Buy: In the app find offers and buy Products. Scan: Then, scan your receipt. Earn: Now, watch earnings stack up. **Plus right now if you Buy 5 participating items + Scan receipt with Box Tops Bonus App = Earn $5 (50 Bonus Box Tops). This offer is available through 1/31/18. 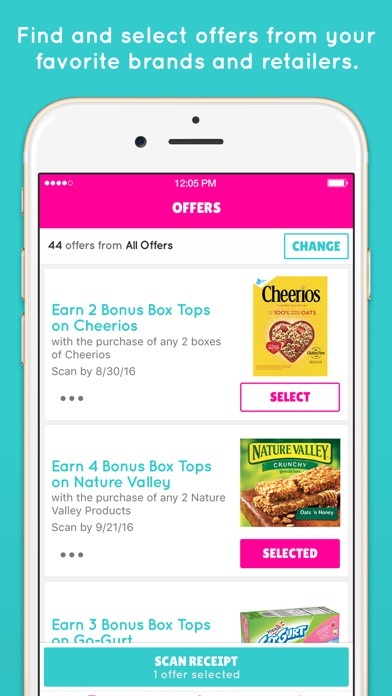 The app and the Box Top Clips can work hand-in-hand, because you can earn Bonus Box Tops in the Box Tops Bonus App in combination with the on-pack Box Tops clips and any other coupon, discount, store program or promotion. The app there is no clipping or storage issues. But with the clipping, you’d be surprised how many great products have Box Tops included on them. Plus once you start clipping, you will also be surprised how quickly these Box Top Clips can add up. But how do I store these Box Tops Clips throughout the year? I decorated a wooden box (found at Walmart) with Washi Tape to store our Box Top clips. See I love decorating and creating with Washi Tape. So, this is a fun way to use Washi Tape to store and hold those Box Tops. Want to make your own DIY Washi Tape Box Tops for Education Clips Storage Box? With larger Washi Tape, begin to cover the sides of the box. With smaller Washi Tape cover the smaller area of box. Then, cover the larger part of top of the box with larger Washi Tape. Next, begin to cover heart trim with smaller Washi Tape. Trim any excess Washi Tape to make the box be covered perfectly. Add FREE Heart Printable Box Tops for Education to the heart shape cutout on the top of the box. Want the FREE Heart Shape Printable Label for your Box Tops Storage Box? See it is that easy to store those Box Tops clips. Plus, it is just as easy to add to your Box Top earnings for your school, by using the app, as well. So go forth and earn for your favorite school now. Do you collect Box Top for Education for your favorite school? This is actually the first time I’ve heard of the Box Tops for Education and I think it’s such a great program. I wish we had something like this, our local schools could use the help! Jhanis, I couldn’t agree more that Box Tops for Education really is a terrific program to help all schools here. Sorry to hear they don’t have this in your country though. We do collect box tops and I just put them into a plastic container in our drawer but I love how you decorated the box! And thanks for the info about the app as well. I love your decorated box and what a cool app. I can see where the app would be extremely helpful. I collect them for my kids’ school. They do help out and whenever we buy any box with box tops, I generally put them in a Ziploc bag, but I’m loving this so much better! OK, your storage solution is so much cooler than my zip bag full of box tops! I am so making one! So cute. I put them in a glass in the cabinet and send them in when it feels like there are “enough” but fun to make a space for them. Schools count on them for sure and this is brilliant. That box is awesome!! So gorgeous. And I had no idea there was an app. I remember Box Tops as a kid and they have grown with the times! You work magic with Washi tape girl! What talent! Pinned! This is so great!! I used to find random places to put my box tops when my school was doing the program, of course I couldn’t remember where it was when it was time to collect!